Off-grid, Online – Y is For Home! There are all sorts of off-grid homesteaders. Some have solar panels that can power a typical suburban lifestyle: television, desktop, washing machine, lights, all the trappings of modern, American living. Others cut down firewood with hand-saws, make their own beeswax candles, and long-ago abandoned phones, computers, and the online life that goes along with it. We try to walk along a middle way. We have one, small “backpack sized” solar panel, the Nomad 7, which can charge our phones (Seth and I each have little flip phones) and our tablet. On the tablet, we can get online with data from the cell company. We have about 8Gs of data, so we try to be responsible, and not-too-distracted by the internet world. On days that we need to do a lot of online work (like loading paintings onto Paperwine or putting up a few blog posts!) we head into town for a few hours of focused work. Our favorite cafes are about 25 minutes in opposite directions, they both have amazing, locally sourced, food and fantastic coffee, and lots of plugs in the wall, so we can recharge a few things while we’re working. At home, we’re currently trying to cut back on the more distracting aspects of being connected. The Tablet has a new home, tucked in a drawer, and we are working out a more focused, schedule-y sort of system of use. I love being connected to far away friends, and I love the unique community forming that happens online, but my priority is being engaged with the people who share this little patch of earth with me..and for me anyway, intentionally ordering my time, limiting my time online strictly, is essential to building a healthy family life. Our kids do not use the tablet, or phones, but they do, occasionally watch a movie on the portable dvd player we have (it can also charge on the solar panel, but it takes forever!) We don’t watch a lot of movies. If it’s a miserable, rainy week or deeply cold, they might watch a couple, but most of the time we read aloud to the kids in off-weather, or let them bring their bikes into the yurt and ride around and around like crazy people until they’re exhausted. who needs t.v. when you have little snake-friends to play with? So, you can stay online while living off-grid, it just takes focus, and a very intentional approach to social media. And it’s a fun combination! It definitely gives us an opportunity to start conversations that might not have happened otherwise, and it’s helping us build the sort of side businesses that lead to being less dependent on consistent, outside employment! Which means Seth can spend more time at home, and we spend less money on things that he can make for us. It’s been a great journey towards that sort of home-based living so far! 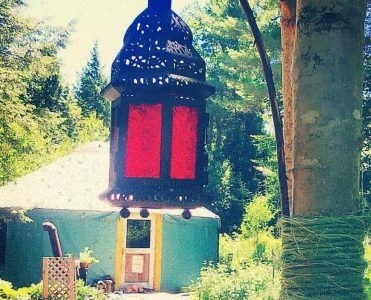 But off grid living isn’t the only way to be intentional about your online life! How do you balance social media and healthy, in person, relationships?